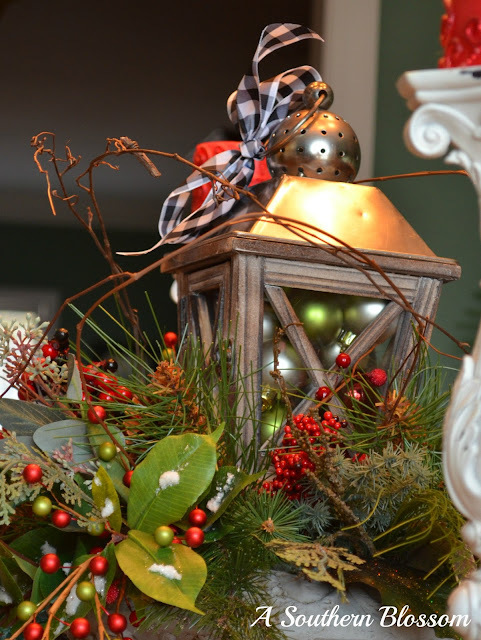 I know I'm like the last person in the blog world to post about Christmas, but I have been very busy lately with work and decorating. This year I even decorated a tree for our unit as well as 3 for my own home. I hope you like a lot of pictures because I took a lot. Every year I put up 3 trees one in the dinning room, one in the living room and one in the back entry from the garage(mud room). 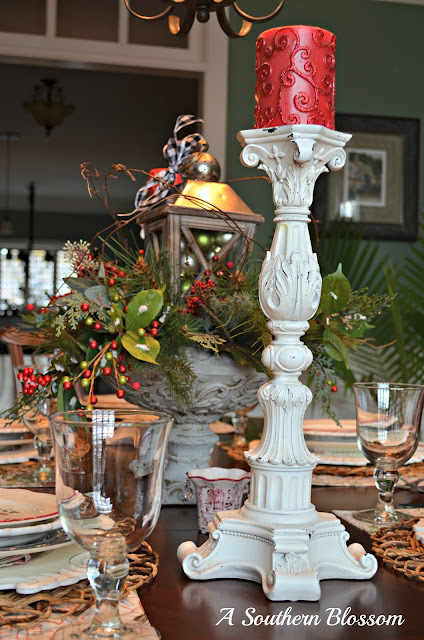 Shall we begin the Christmas tour with the dinning room. 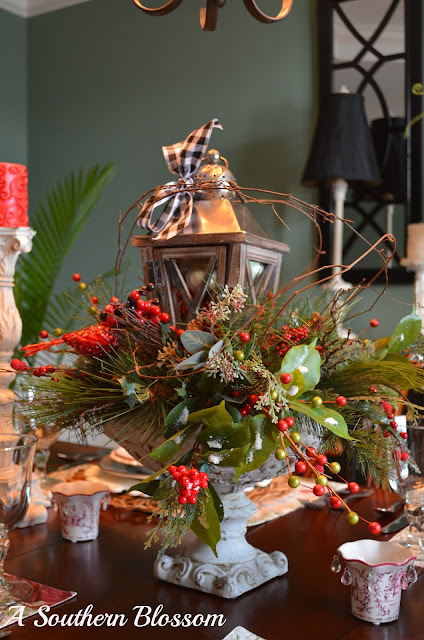 This is a centerpiece I made for the dinning room table, my idea of a woodland Christmas tablescape. 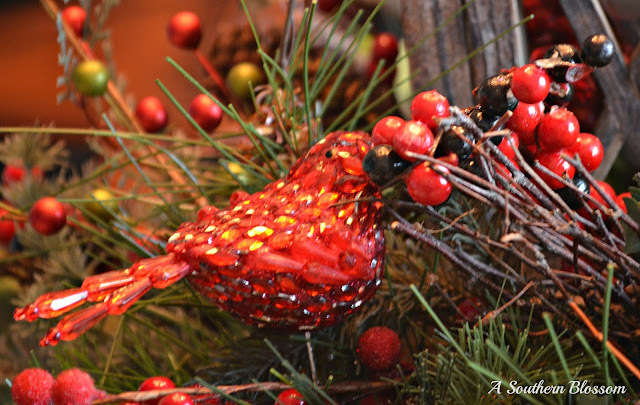 I added a red bird to the arrangement because they are the North Carolina state bird and I also included them in the tree. 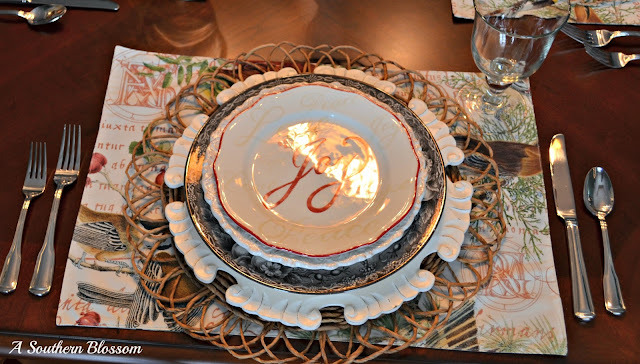 You may recognize the "Joy" plates they are from Walmart part of the Better Homes and Garden series. The placemats are a recent purchase from Pottery Barn the "winter bird" collection. The buffet was dressed up for Christmas with candles and a centerpiece. I included a few pictures taken in the evening light. This tree is adorned with red birds, berries and poinsettias along with a simple black snowman's hat. I love pretty ribbon you could even say I collect it....if you saw my office/junk room you would think so too! This roll actually spoke to me at the store.. it whispered "take me home"
I hope you enjoy my woodland Christmas dinning room. 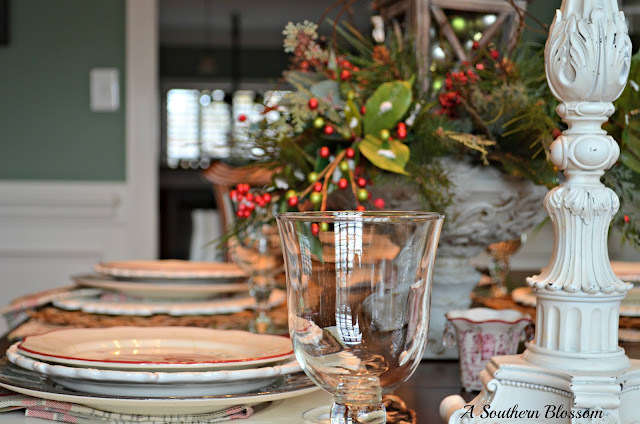 I can't wait for you to see the kitchen tablescape. 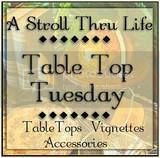 Visiting from WOW....just discovering your beautiful blog and am now following. Your work is absolutely beautiful! Thank you Patty glad we could be friends. Karen, your tablescape is lovely! I love your centerpiece and the mix of dinnerware. Very pretty! Karen your table scape is beautiful and I love your tree to pieces! What a gorgeous table. And I LOVE the top hat! Just lovely, Karen! I love your centerpiece. 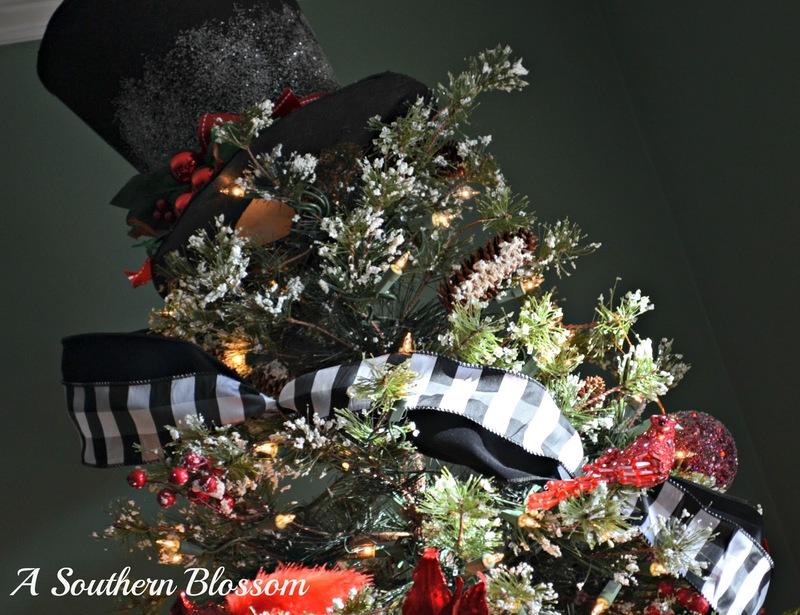 Your tree is gorgeous ~ love the top hat as the tree topper. Simply gorgeous tablescape and dining room! 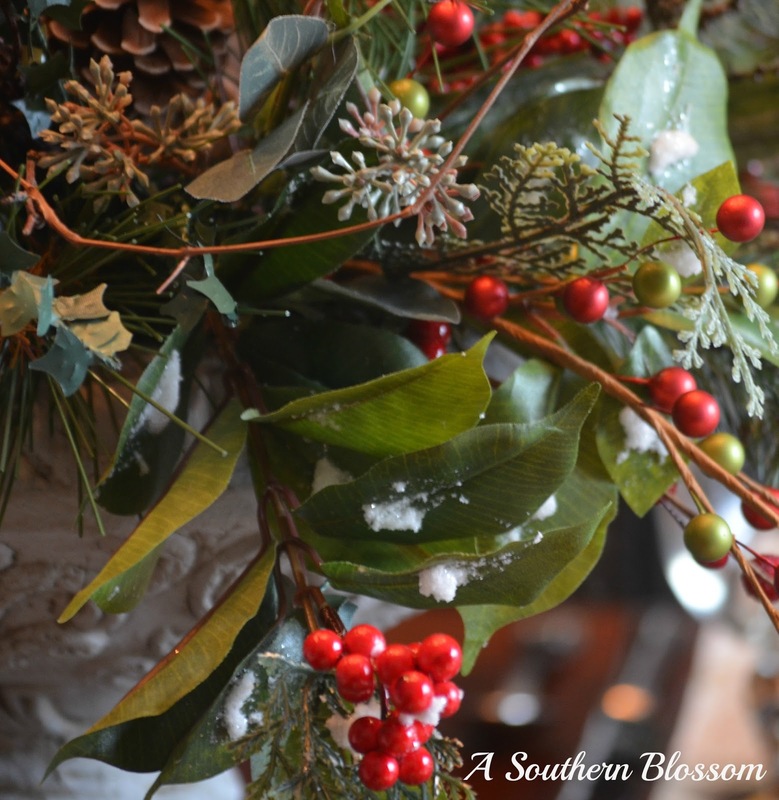 Your tree and table are both gorgeous! GORGEOUS!!! I love it all!! Awesome! 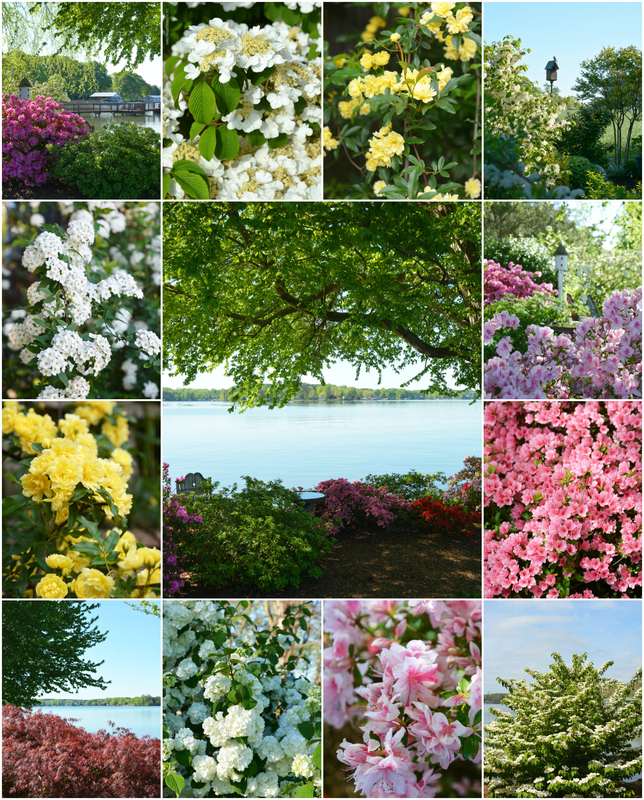 I thoroughly enjoyed READING and viewing your blog.....thanks! Thank you for stopping by and thank you for your sweet comments. 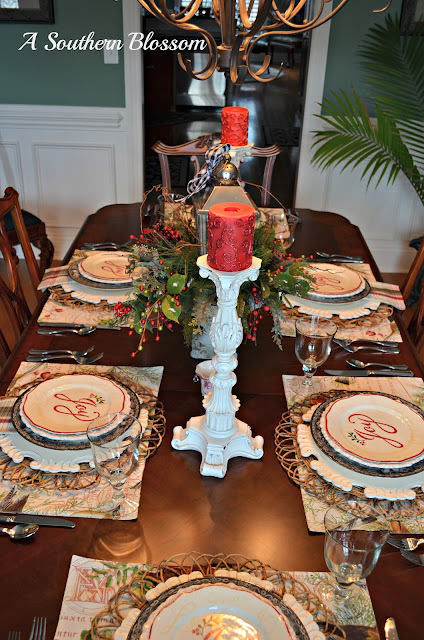 I loved how you used your placemats with the blue napkins, a really beautiful tables cape! G O R G E O U S!!! Just read your profile. I just knew you had to be a Floral Designer!!! Some of my best friends are Nurses and I love that you decorate and blog to relieve stress!!! Your centerpiece is exquisite!!! I love every detail and the Traditional color scheme takes the hat! The SNOWman's hat atop your tree is amazing!!! I love SNOWmen!!! I agree, you needed that ribbon!!! Your red birds and the woodland theme have captured my heart, dear one! 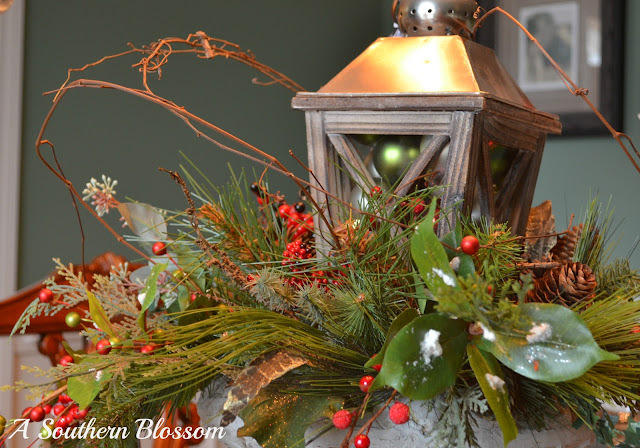 Visiting from StoneGable's A Homespun Christmas Link Pary! Welcome to the Land of Blog...you belong here!!! Karen - this is just gorgeous! 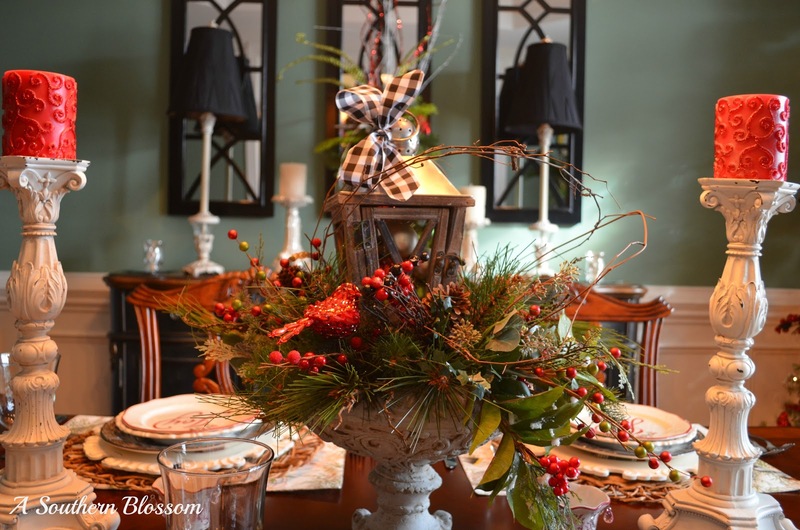 I love, love, love the centerpiece that you created. 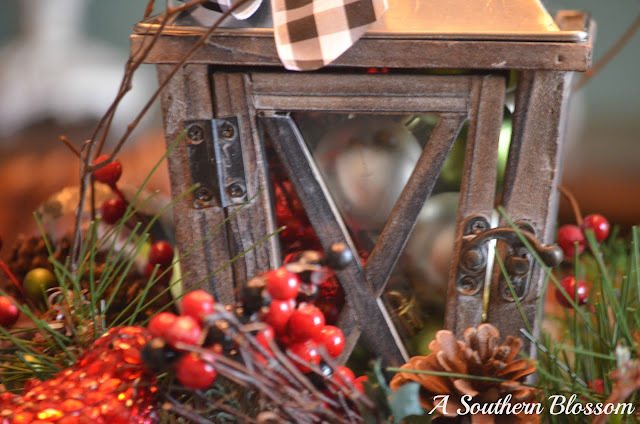 The little bit of black and white ribbon that you added is the perfect finishing touch. I don't think it would be as striking without it. Definitely pinning this to my Christmas board! Thank you for linking up to the Better Late Than Never Christmas Inspirations bloghop. Thank you for visiting my blog, and thank you for your gracious comments. 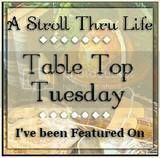 The blog has be a wonderful outlet for me especially considering my job. Once again thank you I love reading everyone's sweet comments. I love love love your pretty tree and the snowman hat is PERFECT. I want to do this NEXT Christmas...where in the world does one find a snowman's top hat ?? Thank you BJ, I found the hat at a local Christmas shop, it's from RAZ Christmas company. Hope that helps. Where did you find the black and white ribbon. 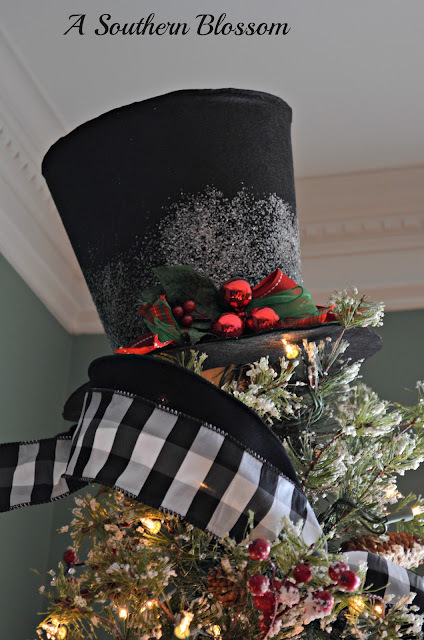 I love it and I am planning a Dickens themed Christmas this year- would love this on my tree. I already have a top hat as I collect Snowmen. Thank you! Teresa G.
This is so fantastic to look at! Your tablescape for the holiday is simply gorgeous! 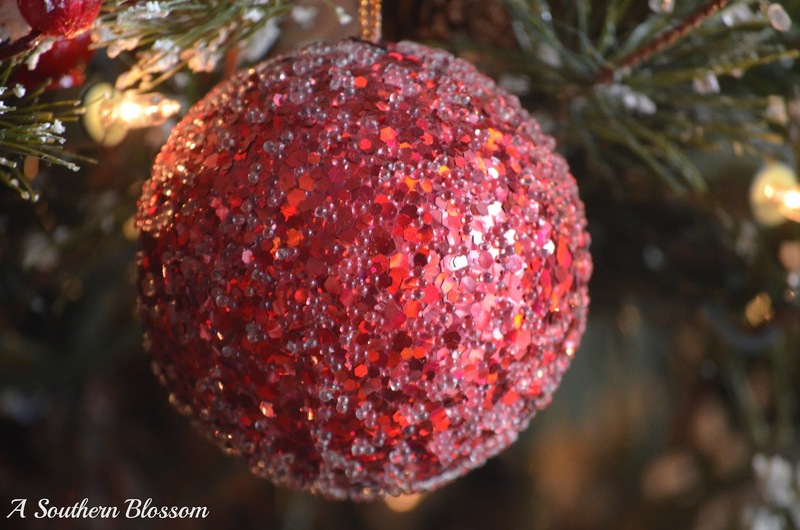 I'll be pinning these on my christmas table decorations Pinterest board, hope you won't mind. 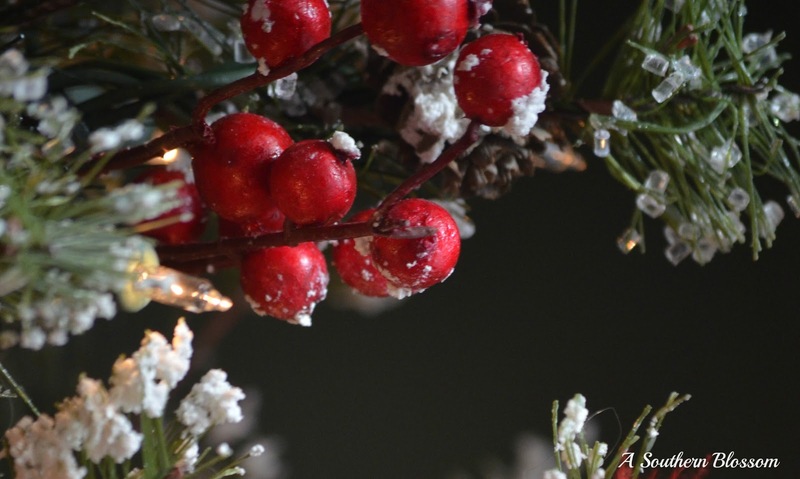 Have a happy holiday! Wow! This looks beautiful. I am a budding designer and I love going through such posts. I have to share this with my friends too. I have lined up some nice event venues for my best friend’s birthday and I want to make that place look beautiful.